The Dharma of number 12 is to remember and practice all that you know. The courage of non-existence that makes all existence possible. In non-existence you are a mirror to all. There is never a reason not to be happy. The Karma of number 12 is anger as an attempt to control the sorrow. Playing around to avoid the reality. Losing the time. Lost in false reflection of self. The 0 of the 10, in karmic expression, will either magnify the separation, negation or attachment (2) to unbearable intensity, or eclipse it and block access to its moving power. As a dharma the 0 will amplify the innocence and eclipse the suffering of duality and direct its passion towards compassion. 2 just negates or attaches without clear discernment. 12 negates all attachments to the conditioned worlds to affirm the One. 12 is to have realized that absolutely everything is a mirror. And then to go into shuniya/zero where there is nothing to be reflected back to you. Which means you become a pure mirror to all. And the greatest and purest thing to reflect to others is their innocence. December is the time to take a resume, a summary, to recap and run through the whole year and know what the final outcome is. When we have applied our intelligence with consciousness there will be the instinctive joy of fulfilment. Depending on the hemisphere December contains the day with the longest or shortest period of dark or light. It is the extreme polarity from where there begins the return to the middle ground of equilibrium. Like extreme denial actually confirms the thing denied. The12 stage of the Mul Mantra is JAP: Ja is Go , with heart, from the heart. Pa is to realize or obtain; it is the abundance. Through repetition of the mantra embodied in virtuous actions. So that, even if not fully sincere, the true actions shall become increasingly real and second nature, (this is also known as the strategy of ‘fake it to make it’). – In summary we are saying practice ‘Unjustified Enthusiasm’, ‘Causeless Joy’, ‘Happiness Without Reason’, and ‘Smiling Because You Can’; and pass it on…..
– The illumination of innocence. – Duality overwhelmed by the unifying light. – Every deed a sacred micro-reflection of the Creator. – In the All Bright realm of Ultimate Light there are no shadows. – As drop of water merges in the ocean, my light merges with Thine. 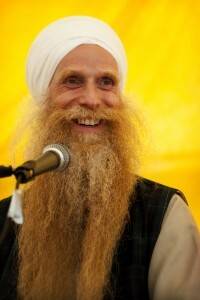 – And the mantra of Victory: Wahe Guru Ji Ka Khalsa Wahe Guru Ji Ki Fateh!